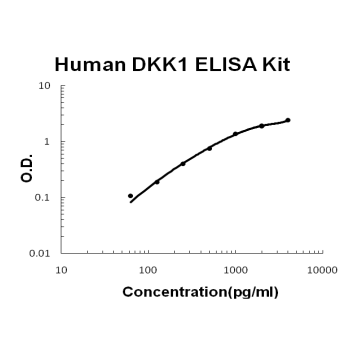 Sandwich High Sensitivity ELISA kit for Quantitative Detection of Human DKK-1. 96wells/kit, with removable strips. Dickkopf-related protein 1 is a protein that in humans is encoded by the DKK1 gene, which was mapped to chromosome 10q11.2. This gene encodes a protein that is a member of the dickkopf family. It is a secreted protein with two cysteine rich regions and is involved in embryonic development through its inhibition of the WNT signaling pathway. Elevated levels of DKK1 in bone marrow, plasma and peripheral blood is associated with the presence of osteolytic bone lesions in patients with multiple myeloma.